The gene and hormone soup that enables women to breastfeed their newborns also can be a recipe for breast cancer, particularly when the first pregnancy is after age 30. Researchers have now found that the gene DNMT1 is essential to maintaining breast, or mammary, stem cells, that enable normal rapid growth of the breasts during pregnancy, as well as the cancer stem cells that may enable breast cancer. They’ve learned that the DNMT1 gene also is highly expressed in the most common types of breast cancer. Conversely, ISL1 gene, a tumor suppressor and natural control mechanism for stem cells, is nearly silent in the breasts during pregnancy as well as cancer, said Dr. Muthusamy Thangaraju, biochemist at the Medical College of Georgia at Georgia Regents University and corresponding author of the study in the journal Nature Communications. “DNMT1 directly regulates ISL1,” Thangaraju said. “If the DNMT1 expression is high, this ISL1 gene is low.” They first made the connection when they knocked out DNMT1 in a mouse and noted the increase in ISL1. Then they got busy looking at what happened in human breast cancer cells. They found ISL1 is silent in most human breast cancers and that restoring higher levels to the human breast cancer cells dramatically reduces the stem cell populations and the resulting cell growth and spread that are hallmarks of cancer. When they eliminated the DNMT1 gene in a breast-cancer mouse model, “The breast won’t develop as well,” Thangaraju said, but neither would about 80 percent of breast tumors. The deletion even impacted super-aggressive, triple-negative breast cancer. The findings point toward new therapeutic targets for breast cancer and potentially using blood levels of ISL1 as a way to diagnose early breast cancer, the researchers report. In fact, they’ve found that the anti-seizure medication valproic acid, already used in combination with chemotherapy to treat breast cancer, appears to increase ISL1 expression, which may help explain why the drug works for these patients, he said. The scientists are screening other small molecules that might work as well or better. Mammary stem cells help maintain the breasts during puberty as well as pregnancy, both periods of dynamic breast cell growth. During pregnancy, breasts may generate 300 times more cells as they prepare for milk production. 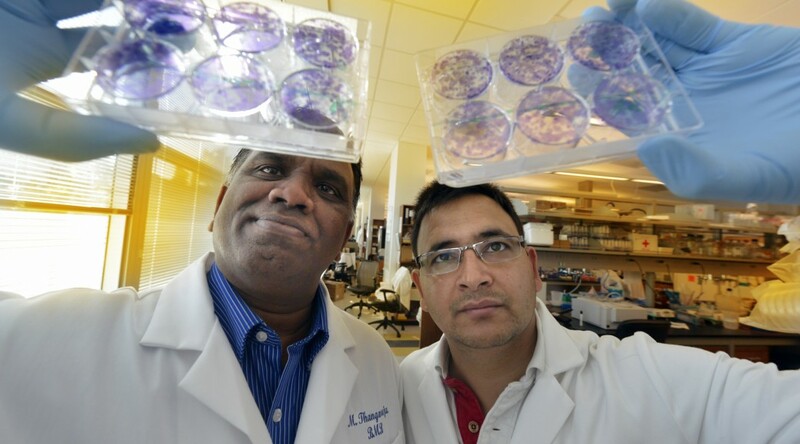 This mass production may also include tumor cells, a mutation that seems to increase with age, Thangaraju said. When the fetus is lost before term, immature cells that were destined to become breast cells, can more easily become cancer, said Rajneesh Pathania, a GRU graduate student and the study’s first author. DNMT1 is essential for maintaining a variety of stem cell types, such as hematopoietic stem cells, which produce all types of blood cells. But, its role in regulating the stem cells that make breast tissue and enable breast cancer has not been studied, the scientists write. While the exact reasons remain unclear, there is an increased risk of breast cancer if the first pregnancy occurs after age 30 as well as in women who lose their baby during pregnancy or have an abortion. Women who never have children also are at increased risk, while multiple term pregnancies further decrease the risk, according to the American Cancer Society. Theories include that the hormone-induced maturation of breast cells that occurs during pregnancy may increase the potential for breast cancer cells to be made as well. Also, most breast cancers thrive on estrogen and progesterone, which are both highly expressed during pregnancy and also help fuel stem cell growth. During pregnancy, stem cells also make more of themselves so their population increases about five times. DNMT1 levels experience a similar increase. In five different types of human breast cancer, researchers found high levels of DNMT1 and ISL1 turned off. Even in a laboratory dish, when they put the ISL1 gene back, human breast cancer cells and stem cell activity were much reduced, Thangaraju said. 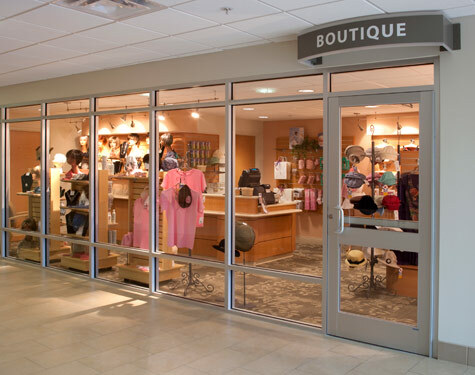 The Image Boutique is located on the first floor of the Cancer Center. Few things in life are more harrowing than battling cancer, but surviving it is only the beginning of the healing process. Located in the GRU Cancer Center, the Image Boutique is a one stop shop for clothing, wigs, and prosthetics for female cancer survivors. Family and friends of cancer patients and survivors can also find gifts and inspirational items. The Image Boutique also is a place where patients and survivors can go to feel whole again. The boutique’s helpful, caring staff work to ensure no one fighting cancer ever has to fight it alone. 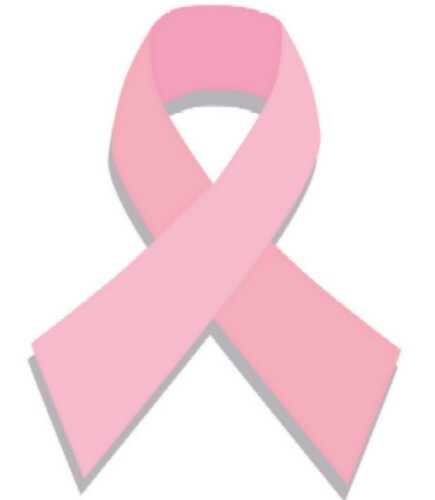 In recognition of Breast Cancer Awareness Month, Women’s Health is raising funds to donate scarves to the Image Boutique. These scarves, stitched with inspirational messages for women fighting cancer, are provided by Thirty-One Gifts. All commission earned from the sale of the scarves will be donated to the GRU Cancer Center to assist patients in need of prosthesis and wigs. In addition, for every scarf purchased, Thirty-One Gifts will donate 31 cents to organizations that benefit the empowerment of women, girls, and families. Patients and survivors can make appointments with the Image Boutique to be fitted for wigs, prosthetics, or underwear following surgery or chemotherapy. For more information about the Image Boutique or to schedule an appointment, contact 706-721-0466. To donate $10 for a Thirty-One Gifts scarf, contact Angela Cannady at 706-721-2537 or acannady@gru.edu. To make a donation, contact Stacy Carrigan at scarrigan@gru.edu. Every Friday during the month of October has been designated as “Pink Friday,” everyone is encouraged to wear something pink on that day. Also, Saturday mammogram appointments will be available throughout the month of October from 9 a.m.-1 p.m. Make an appointment today by calling 706-721-XRAY or visit gru.edu/breasthealth. 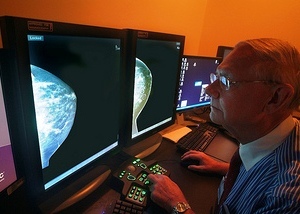 Radiologist Dr. James Craft reviews the breast images captured using 3D mammography, or tomosynthesis, at Georgia Regents Medical Center. Augusta, Ga. – In recognition of October as national Breast Cancer Awareness Month, the Breast Health Center at Georgia Regents Medical Center is offering Saturday mammograms on October weekends. Women may schedule a routine mammogram beginning Oct. 5 or any other Saturday in October between 9 a.m. and 1 p.m. by calling 706-721-XRAY (9729). In 2011 Georgia Regents Medical Center became the first health system in Georgia – and one of only a few in the nation – to screen patients for breast cancer using tomosynthesis, a 3D digital mammogram that improves cancer detection and reduces false-positive results. The Georgia Regents Breast Health Center, which performs more than 5,000 mammograms per year, is an American College of Radiology Breast Imaging Center of Excellence. The Breast Cancer Prevention Coalition of the CSRA will recognize the research efforts of Drs. Ahmed Chadli, Ravindra Kohle, and Lesleyann Hawthorn at 3:30 p.m. Friday, Aug. 9, during a reception at the GRU Cancer Center Clinical Building, 1411 Laney Walker Blvd. 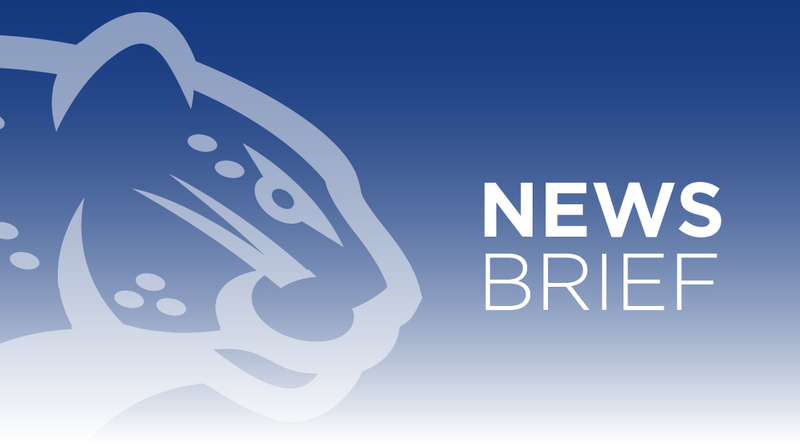 The program will include a synopsis of each researcher’s current work and the presentation of approximately $90,000 in research funding by the coalition. Chadli is a member of the Molecular Oncology and Biomarkers program at the GRU Cancer Center. His current research focuses on a recently characterized and highly aggressive breast cancer – molecular apocrine breast cancer – and the role androgen receptors play in the growth of these tumors. Kolhe is the Laboratory Director of the Georgia Esoteric and Molecular Diagnostic Labs in Pathology at GRU and a member of the Clinical Oncology program at the GRU Cancer Center. His current research focuses on the role of immune system inhibitors in breast tumor growth and, ultimately, treatment. Hawthorn is Director of GRU Cancer Center Shared Resources and a member of the Molecular Oncology and Biomarkers team. Her current research focuses on the molecular profiling of aggressive Triple Negative breast cancers in the African-American population. This tumor type has proven particularly aggressive in African-American women, and this research is an important component of the GRU Cancer Center’s disparity research goals. The GRU Cancer Center is a multi-disciplinary academic cancer center focused on both research and clinical treatment. Its patient-centered approach to treatment includes first-in-the-nation treatment protocols, an experimental therapeutics program that includes specialized clinics for Phase I trials and immunotherapy, and a variety of ancillary programs – including music therapy and genetic counseling – designed with holistic healing in mind. 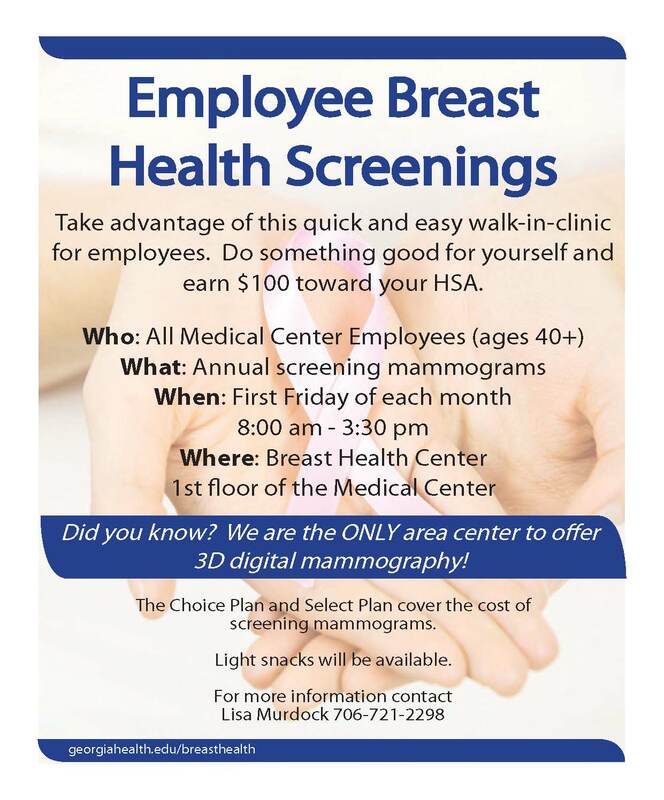 All Medical Center employees who are 40 years and older are eligible to take advantage of the annual mammogram screenings being offered from 8 a.m. – 3:30 p.m. the first Friday of each month. Screenings are held in the Breast Health Center on the first floor of the Medical Center on the Health Sciences Campus. For more information, call Lisa Murdock at 706-721-2298.